We’d love your help. Let us know what’s wrong with this preview of The Resurrectionist by E.B. Hudspeth. Philadelphia, the late 1870s. A city of gas lamps, cobblestone streets, and horse-drawn carriages—and home to the controversial surgeon Dr. Spencer Black. The son of a grave robber, young Dr. Black studies at Philadelphia’s esteemed Academy of Medicine, where he develops an unconventional hypothesis: What if the world’s most celebrated mythological beasts—mermaids, minotau Philadelphia, the late 1870s. A city of gas lamps, cobblestone streets, and horse-drawn carriages—and home to the controversial surgeon Dr. Spencer Black. The son of a grave robber, young Dr. Black studies at Philadelphia’s esteemed Academy of Medicine, where he develops an unconventional hypothesis: What if the world’s most celebrated mythological beasts—mermaids, minotaurs, and satyrs—were in fact the evolutionary ancestors of humankind? To ask other readers questions about The Resurrectionist, please sign up. This book has blown me away...I can't figure out if this is historical fiction or a non fiction book...please advise? Morbid curiosity drew me to this book. Seriously, you need a morbid curiosity with this book due to the speculative subject matter and the depraved experiments that are entailed within. The story is interesting and captivates you in a really twisted way. The level of detail that went into the artwork is astounding, and is the biggest draw of the book. The actual story is only 65 pages long. There are too many loose ends. In conclusion, I really loved this as a whole for what it was Morbid curiosity drew me to this book. Seriously, you need a morbid curiosity with this book due to the speculative subject matter and the depraved experiments that are entailed within. In conclusion, I really loved this as a whole for what it was. The illustrations alone make this a worthwhile read. This is one of the rare occasions I would recommend buying the physical book over a digital copy because of the artwork. I was expecting more of a story though, and that is the only reason why I didn't give this a whole 5 stars. The Resurrectionist: The Lost Work of Dr. Spencer Black I'm pretty unclear on the fiction to non-fiction ratio going on in this book (mythical creatures notwithstanding). However, having endured several semesters of the history of science and cranked out more than one term paper on curiosity cabinets, I can safely say that almost all of this could have been true. Scientists, doctors, surgeons and whatnot by necessity were talented artists (if you don't believe me, check out Galen and Vesalius' c The Resurrectionist: The Lost Work of Dr. Spencer Black I'm pretty unclear on the fiction to non-fiction ratio going on in this book (mythical creatures notwithstanding). However, having endured several semesters of the history of science and cranked out more than one term paper on curiosity cabinets, I can safely say that almost all of this could have been true. Scientists, doctors, surgeons and whatnot by necessity were talented artists (if you don't believe me, check out Galen and Vesalius' circulation diagrams). "Resurrectionists" (aka grave robbers and/or body snatchers) were requisite suppliers for surgeons and medical students throughout the 19th century (see also The Italian Boy: A Tale of Murder and Body Snatching in 1830s London). And, what's more, the natural historians' "cabinets of curiosity" did branch off into the very un-P.C. "freak shows" and circuses. Dr. Spencer Black's tale involves all of the aforementioned elements at their darkest and most horrifying. Convinced that mythological creatures were evolutionary offspurts, and that he could re-unlock the key to past lives in living creatures, Black's descent into madness took quite a few twists and turns. The book is short and full of illustrations, so I don't feel all that guilty not offering much in the way of a summary. Sidenote: As someone who cried during the Fox and the Hound and was left catatonic after seeing White Fang (to say nothing of Old Yeller), there were definitely parts of this that I had to skim. According to Dr. Spencer Black, mythological creatures -- mermaids, fawns, minotaurs, etc. -- were the evolutionary ancestors of humankind. In attempt to prove his theory, he ventured down a dark path, cobbling together body parts in the depths of a gaslit storage shed. His progress was cataloged in a number of chilling letters written to his brother, and the result of his work was The Codex Extinct Animalia: A Study of the Lesser Known Species of the Animal Kindgom, replete with detailed anatom According to Dr. Spencer Black, mythological creatures -- mermaids, fawns, minotaurs, etc. -- were the evolutionary ancestors of humankind. In attempt to prove his theory, he ventured down a dark path, cobbling together body parts in the depths of a gaslit storage shed. His progress was cataloged in a number of chilling letters written to his brother, and the result of his work was The Codex Extinct Animalia: A Study of the Lesser Known Species of the Animal Kindgom, replete with detailed anatomical illustrations. His biography, letters, and the Codex are included in this imaginative, wonderfully disturbing book. Do you remember when horror, dark fantasy, and weird fiction were almost as fringe as the occult studies themselves? Unfortunately for many fans of the grotesque and horrible, the stratospheric rise of franchises like Twilight and Harry Potter have, whatever their individual merits, stripped us of our creepers and crawlers, nightmares and madness, and returned them as a sanitized, sterile, and often vapid caricatures for their former macabre beauty. It can be tough to find quality examples of twisted fiction in today's saturated market with its deluge of zombies, vampires, and dime-a-dozen serial killers, murderous vigilantes, and caped crusaders. But if, like me, you value true fright for the sake of its uncanny allure, if you like gazing over the edge of the abyss into the quivering, cannibalistic recesses of the human mind, I've got some horribl(ly) excellent news for you. The Ressurectionist, by E.B. Hudsperth, is a one-of-a-kind treasure. And it's damn beautiful, too. Quirk Books is a publisher of books that are, well, quirky. I'd be hard pressed to describe The Resurrectionist so lightly, though. When I think "quirky," I think ironic, dryly humorous and maybe with a tinge of underground dissent or unexpected cuteness. I don't think "mad scientist," I don't think "taxidermy gone knives-to-the-wall crazy," and I most certainly don't think "alternate evolutionary theories, Darwin be damned!" But that's precisely what's the the book purports to be. A fascinating blend of fiction and art, The Resurrectionist sinks its hooks into your guts and doesn't let go as it examines with the unflinching scrutiny of an autopsy the strange life of Dr. Spencer Black and his increasingly deranged work. The first half of the book is that biographic novella, which weighs in at 63 pages; the second half is an equally long full-page anatomical study of some of the most famous creatures out of myth and legend. 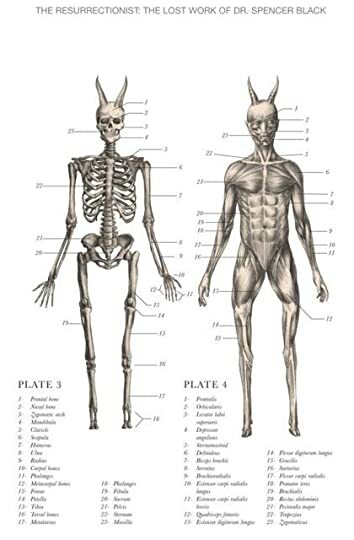 These include skeletal, muscular, and tissue-level renderings. Hudsperth’s fantastic art is worthy of its own coffee-table book, providing plenty of examples for all levels of horror geeks to learn and examine. Think of this as a Grey's Anatomy of cryptids, and you'd be on the right track. But The Resurrectionist is not a one-trick pony. I might try to sell itself on the merits of the fascinating art in the back, but that doesn't mean the biography is allowed to skid by on easy heels. The study of Dr. Black's life is fully fleshed out and disturbingly believable. For fans of Lovecraft, Stephen King, or any quality horror writer, Dr. Black's archetype will be instantly recognizable: a misguided genius driven to psychopathy by the same enlightenment that elevated him in the first place. Characters like Richard Pickman, the musician in "The Music of Erich Zann," and of course the mad Arab himself would find kin in Spencer Black's spirit. Chronicling the rise of Black from his childhood all the way to his life, Hudsperth’s fictional reconstruction of Black's psyche reveals all the tells of a true madman: early, gruesome exposure to death, a fascination with the impossible, and the deep sense of isolated understanding genius is supposed to bring. His father, a grave-robbing anatomist, often called a "Resurrectionist" because of the bodies he steals, teaches his sons to study closely and carefully the secrets of the human body. By his early twenties, Spencer Black proves himself to be a prodigy surgeon, his genius is fourishing to perform medical miracles that win him fame the world over. But like the many evil geniuses before him, he is impatient with the knife, unsatisfied with the imperfect work it does. He turns to darker, older secrets, to the lore of the old world in which he finds, eventually, an alternative theory to the pervading Darwinian explanation of biological evolution. From this new understanding, he reasons, all of the monsters of myth and legend came to evolve into the human race. This belief drives him to the fringe, much the way of Dr. Taleyarkhan and others regarding Cold Fusion in the twentieth century. In his search for "evidence," Black's chronicler does little to discourage the reader from despising him. It reads like one would expect a textbook examination of a monster to read; the bias is clear and unshorn. This lends a further sense of credence to the tale, since it gives the illusion of a studied and long-held grudge against the man, similar to how we view Jack the Ripper nowadays with a macabre fascination and abhorrence. Indeed, Jack and Spencer share much and more. What struck me most about The Resurrectionist is how well it is put together. The novella is well-written and precisely paced, to be sure, but it works its magic in the conjectured diagnosis of Spencer Black's motive. The included letters from various participants, scribbled nonsense, and circus-style advertisements for his godforsaken sideshows crank the verisimilitude to 11. And, it bears mentioning that the typeface, coloring, and internal layout scream care and attention. It goes without saying, too, that a lot of love was poured into the anatomical portion of the book. Those strange taxidermist drawings are given both reason and justifications for existence by the unsettling tale that preludes them, which in turn requires the drawings to exist. The book could have been like any bargain-bin visual sell, one of the dozens perpetually resident in the Barnes &Noble clearance isles, but the production is as sleek and svelte as can be. I can't imagine this there; it belongs right in the art section, perhaps alongside the fantasy where normally your find art books dedicated to Tolkien and Lovecraft. Part Frankenstein, part Gray's Anatomy, and seemingly sprung from the mind of a man like H.H. Holmes, The Resurrectionist makes it nearly impossible to tear your eyes away from the horror and spectacle it presents. I can think of a hundred people who would find this a terribly disagreeable book.... and a lot more who wouldn't be able to set it down. The Resurrectionist exists with grim purpose and grotesque style, seeking to recapture our fascination with the politically-incorrect freak shows of yesteryear (we call it Reality TV today). For a fan of dark fantasy and horror, it represents the fusing of two distinct lines of interest into a peerless package of twisted genius. 3.5 stars. Inventive idea to combine grave robbing, and mid-1800s medicine with carnivals and cryptids. Dr Spencer Black begins as an assistant grave robber for his father, then becomes a doctor and a gifted surgeon. He becomes fascinated by the idea that mythical creatures existed in the past, and human mutations (fused digits and other unusual bony and soft structures) are remnants of these creatures in our physiology. Spencer Black begins experimenting on animals, fusing different animals' bo 3.5 stars. Inventive idea to combine grave robbing, and mid-1800s medicine with carnivals and cryptids. Dr Spencer Black begins as an assistant grave robber for his father, then becomes a doctor and a gifted surgeon. He becomes fascinated by the idea that mythical creatures existed in the past, and human mutations (fused digits and other unusual bony and soft structures) are remnants of these creatures in our physiology. Spencer Black begins experimenting on animals, fusing different animals' body parts together, and eventually loses the respect of his peers for his claims and behaviours and beliefs. Spencer appears progressively crazy to others while he travels the world, first with a carnival, then on his own, searching for evidence for his hypotheses and continuing his experiments. Then he disappears. A copy of The Resurrectionist was provided to me by Quirk Books for review purposes. Dr. Spencer Black is a controversial surgeon in the late 1870's who has developed a fascination with the deformities of the human body. It's a gruesome and at times shocking tale of the lengths the good doctor would go to in order to continue his research. This story definitely had potential to fascinate, especially regarding the aspects that Black believed deformities were actually 'evidence of a genetic code that was not completely eradicated'. The idea that mythological creatures were ancestors of humankind is really quite intriguing but unfortunately failed to stir any lasting interest. It all read like a Wiki page: informative yet dry and oftentimes tedious. I think it would have been much more interesting if written as an actual short story or novella rather than a biography. The best part of this book was the amazing artwork included in Black’s magnum opus: The Codex Extinct Animalia, a Gray’s Anatomy for mythological beasts. The artwork was incredibly detailed and Reading this book as an ebook would hardly do it justice considering this is very much a coffee-table type book. It's also a book that could be read through quickly (considering the text amounts to approximately 65 pages) but considering the style of writing it may be more interesting to read small bits at a time. Morbid. Macabre. Shocking. OK enough adjectives for you. I will warn any readers who are shrinking violets to avoid this book altogether. The Philadelphia's Museum of Medical Antiquities helped in the publishing of this book by providing many of the preserved notes. It is a shocking and disturbing, depending on your mindset, biography of a deeply brilliant and shockingly disturbed Doctor. Born in Boston in 1851, Dr. Spencer Black and his older brother, Bernard, to renowned surgeon Gregory Black. Morbid. Macabre. Shocking. OK enough adjectives for you. I will warn any readers who are shrinking violets to avoid this book altogether. The Philadelphia's Museum of Medical Antiquities helped in the publishing of this book by providing many of the preserved notes. It is a shocking and disturbing, depending on your mindset, biography of a deeply brilliant and shockingly disturbed Doctor. Born in Boston in 1851, Dr. Spencer Black and his older brother, Bernard, to renowned surgeon Gregory Black. Dr. Black was a respected professor of anatomy at the Medical Arts College of Boston. But he had a dark side-many of the cadavers for his research came from grave-robbing. In fact, he took his sons with him on his escapades to find "subjects". The father dies of smallpox in 1868 and this convinces both brothers to pursue medical studies. Both brothers enter the Philadelphia Academy of Medicine and while Bernard is quite a good student, it turns out that Spencer is brilliant. Bernard focus on natural history, fossils and natural sciences. Spencer in his first year begins to specialize in the studies of mutations and focuses on sharpening his illustrations skills by sketching anatomy for other Professors. Eventually Spencer's brilliance leads him getting his own Ward-Ward C. Inside Ward C revolutionary medical procedures cement Spencer's reputation as a prodigy. His illustrative skill has also reached an exceptional level. The rest of the book-using his notes and diary entries shows the slow and steady disintegration of this brilliant mind. His fascination with vivisection and anatomy have caused him to alienate his other colleagues with his bizarre utterances about legendary creatures. I will not ruin the rest-but it is rather shocking and graphic when you find out what Dr. Black has really been up to. The rest of the book, which is divided into two parts, finishes the downright shocking and horrifying biography of a once brilliant, but now deeply disturbed person. I will warn you that what is described, is rather graphic. The second part of the book is the Codex Extinct Animalia- stunning reproductions of his vivisectional sketches. He thought there were real mythological creatures and spent time creating "real life" versions of these mythological beats. Hybrid Art Forms in Man: At what point does “man” begin and “animal” end? The Resurrectionist: The Lost Work of Dr. Spencer Black opens with a dense, interesting narrative: the biography of the dark protagonist. Readers tend to get bored with extended narratives, so this introduction is appropriately short. It is a compelling setup, of course, for the illustrations (the latter 2/3rds of book). The author sets the horrific tenor here, enticing the reader to share the excitement that Spencer feels Hybrid Art Forms in Man: At what point does “man” begin and “animal” end? I hear them marvel at my work—my indignant science. I hear them call out in fear of what they see. And there are some gentlemen who doubt what I will tell them. They call me a liar and a charlatan or a quack. But in time the methods of science that I now employ to convince people will surely set them free—alas, this I cannot explain to the angry fools. The setting is ideal for redefining the nature of “man.” The turn of the 19th century was rich with advances in evolutionary theory, science, and even speculative fiction. Anatomists, philosophers, and scientists ruminated on how far to extrapolate Darwin’s assertions. 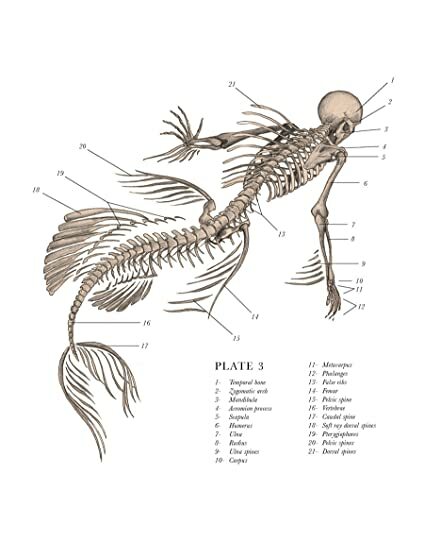 Most understood that all vertebrates shared a common skeletal structure; but if animals and man were connected in their development, was it not reasonable to reconsider the existence of creatures termed mythological? Were centaurs real? Harpies? Demons? Spencer Black needed to know. Hudspeth uses him to lure us on this quest. At what point does “man” begin and “animal” end? The fictional Spencer Black is more corrupt than the real Ernest Haeckel, but now their books share space on my bookshelf. I recommend the hardcopy so you can use it as coffee table book. The anatomical drawings of mythological creatures will certainly entertain and inspire. Preview his artwork at his website: http://ebhudspeth.com/blog/artwork/ . **This book was received as an ARC from Quirk Books. 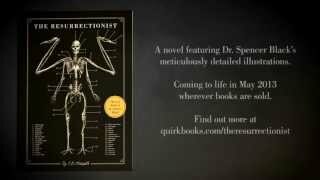 The Resurrectionist: The Lost Work of Dr. Spencer Black is essentially two books in one, the first being The Life of Dr Spencer Black. Believing that mythological creatures are our (human) ancestors, Dr Black proceeds to embark on a journey of scientific discovery. A journey that seems to slowly drive him into madness and ruins any credibility he may have had within his field of study. I will give word of warning, this section is most definitel **This book was received as an ARC from Quirk Books. The Resurrectionist: The Lost Work of Dr. Spencer Black is essentially two books in one, the first being The Life of Dr Spencer Black. Believing that mythological creatures are our (human) ancestors, Dr Black proceeds to embark on a journey of scientific discovery. A journey that seems to slowly drive him into madness and ruins any credibility he may have had within his field of study. I will give word of warning, this section is most definitely not for someone with a weak stomach. It is very descriptive and there is a good portion dealing with vivisection, which is essentially surgery/dissection of a living creature. While it is very descriptive and gruesome, I found it also very intriguing and actually wish this section was longer. The second section is The Codex Extinct Anamalia in which Dr Black documents and illustrates his findings of the lesser known species of the animal kingdom. This section is mostly illustrations of various species muscular and skeletal structure done very similarly to Gray's Anatomy. It is well done artwork and for those with great interest in the structure and anatomy of mythological species this is a wonderfully detailed and well done section. I could even see tattoo artists using this as inspiration for pieces. Marvelously done anatomical drawings of creatures of myth, but a stale fictional biography. The Resurrectionist was written for a very specific audience – who that audience is I’m not exactly quite sure. It’s definitely not one that I can think of anyone right on hand to recommend it to. Perhaps those that enjoy fictional biographies, somber crazed scientists but in an overall droll package? This is the second fictional biography/autobiography I’ve read and it was interesting to see how this was Marvelously done anatomical drawings of creatures of myth, but a stale fictional biography. The Resurrectionist was written for a very specific audience – who that audience is I’m not exactly quite sure. It’s definitely not one that I can think of anyone right on hand to recommend it to. Perhaps those that enjoy fictional biographies, somber crazed scientists but in an overall droll package? This is the second fictional biography/autobiography I’ve read and it was interesting to see how this was done. I definitely prefer the autobiography approach more so than the biography. Perhaps if it had been written as such Spencer Black would have been more dynamic and gripping of a character. I think it has a pretty accurate flavor of the time period right of the 1850′s to early 1900s. Of the 208 pages, really only the first 65 of those pages are the biography. The remaining portion of the book is made up of ‘The Codex Extinct Animalia’ which is exactly what it is but being of completely mythological and or creatures of legend. Every few pages you’ll see a different creature along with the notes about that creature from Spencer Black. Admittedly I really didn’t know how to describe my feelings for this one – I’d have to settle on ambivalent. The Resurrectionist: The Lost Work of Dr. Spencer Black is a throwback to the old horror tales of Shelley, Stoker and even dare I say; Lovecraft. Yes I liked it that much. It is actually two books in one. The first book being the story of Dr. Spencer Black and the second being The Codex Extinct Animalia by Dr. Spencer Black. The Codex is a Gray's Anatomy tome to mythical creatures. The drawings of these creatures are detailed and fantastic. The story of Dr. Spencer Black is something altogether The Resurrectionist: The Lost Work of Dr. Spencer Black is a throwback to the old horror tales of Shelley, Stoker and even dare I say; Lovecraft. Yes I liked it that much. It is actually two books in one. The first book being the story of Dr. Spencer Black and the second being The Codex Extinct Animalia by Dr. Spencer Black. The Codex is a Gray's Anatomy tome to mythical creatures. The drawings of these creatures are detailed and fantastic. The story of Dr. Spencer Black is something altogether different. Born the son of a respected Professor of Anatomy, Spencer and his brother Bernard would go grave robbing with their father at the young age of eleven. As he became a young man Spencer then turned his studies to medicine and healing birth deformities. It was here, at Philadelphia's Academy of Medicine that Dr. Spencer Black would come to the theory that would change his life. The belief that birth abnormalities were in fact, the human body remembering what it once was. That the creatures of old, myths and legends, did at one time exist and that we humans, came from this. The story of Dr. Stephen Black concludes in macabre and tragic fashion. Harkening to such excesses of science such as Stevenson's Dr. Jekyll and Mr. Hyde or Shelley's The Modern Prometheus. There is horror here and it builds as Blacks descends into his own madness. I enjoyed this short tale very much. The artwork in the book is outstanding and the storytelling well paced and suspenseful. I recommend it highly. The book is done by a small publisher called Quirk Books and well worth the search to find your own copy. Dark and delicious. That may sound odd. but this book was the perfect combination of beautiful writing and dark subject matter that made me savor every page. Now, that's not to say that there are parts of this book that aren't a bit disturbing. Some of the descriptions of Dr. Black's experiments aren't for squeamish readers (and I will admit that a few times, I skimmed ahead slightly because of this). However, as much as I was repelled by Black at times, I felt compelled to keep reading. I suppo Dark and delicious. That may sound odd. but this book was the perfect combination of beautiful writing and dark subject matter that made me savor every page. Now, that's not to say that there are parts of this book that aren't a bit disturbing. Some of the descriptions of Dr. Black's experiments aren't for squeamish readers (and I will admit that a few times, I skimmed ahead slightly because of this). However, as much as I was repelled by Black at times, I felt compelled to keep reading. I suppose I was curious to see what he would do next, as he apparently was descending into madness as time went on. I felt the author did a nice job of combining historically accurate elements, such as some of the attitudes in the medical community during the nineteenth century, along with fantastical creatures. 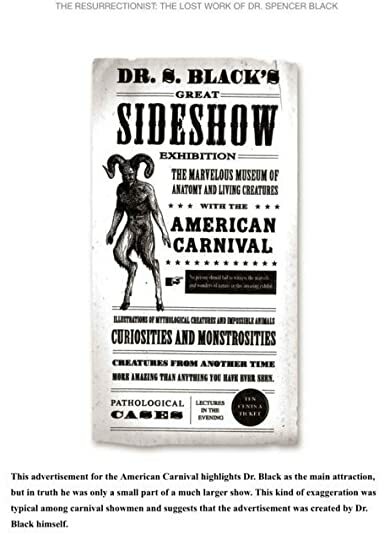 Black's decision to join a carnival, with his "Anatomical Museum" is also in keeping with that time period. he writing style is also interesting --- the story of Dr. Black is told as if by a researcher, who has come upon Black's papers and research. It lends an outsider point of view, which I liked. Something else that's really cool about this book is that the second half is filled with detailed drawings of creatures such as harpies and mermaids. I found myself poring over these, marveling at all the intricate detailing and labeling ---- and then wondering about this Dr. Black and the lengths he would have had to go through to make such illustrations. This kind of book has long been needed and I hope more mythical and folklore creatures get the same treatment. This review was originally posted on my blog: www.acreads.blogspot.com. I was so incredibly stoked when I received The Resurrectionist - simply put, it is a beautiful and stunning book. The book is broken up into two sections - first, the biography of the fictional anatomist, Dr. Spencer Black and second, a fictional Gray's Anatomy of sorts, filled with beautiful anatomical sketches of mythological creatures. The Codex Extinct Animalia speaks for itself - it is gorgeous. The sketches are professi This review was originally posted on my blog: www.acreads.blogspot.com. Don't get me wrong, this story was riveting... but it was also incredibly disturbing and pretty gory at some points. At times, I found myself physically cringing... and I don't typically get grossed out that easily. I think that if I read The Resurrectionist closer to Halloween, I would have appreciated it a lot more but for now, I found it pretty disturbing. The illustrations and plates in this book are wonderful, and the book is aesthetically lovely. However, the short “biography” of the fictitious Dr. Spencer Black was more than I could handle. At only 65 pages, you'd think I could manage it, but I threw up my hands (and almost my lunch) around page 46. I'm usually game for something fairly grisly, and didn't have a problem (or so I thought) reading about grave robbers, “resurrectionists,” of the 19th century. Smelly old corpses being exhumed and s The illustrations and plates in this book are wonderful, and the book is aesthetically lovely. However, the short “biography” of the fictitious Dr. Spencer Black was more than I could handle. At only 65 pages, you'd think I could manage it, but I threw up my hands (and almost my lunch) around page 46. I'm usually game for something fairly grisly, and didn't have a problem (or so I thought) reading about grave robbers, “resurrectionists,” of the 19th century. Smelly old corpses being exhumed and stolen in the middle of the night – hey, no problem. But I absolutely cannot read about vivisection. When I got to the part about crazy Dr. Black's experiments in that arena, I couldn't go on. Yes, I know it is fiction, this particular tale, but it is so very deeply disturbing to me that I am going to have trouble washing the images out of my mind. And this is with not finishing the book. Perhaps people with stronger stomachs than mine will do better with it, but I can't imagine anyone short of a serial killer in training actually enjoying it. Interesting book, not like anything I have read before, which does not qualify it as the greatest book I've ever read. Still, there were some things to commend it. Hudspeth has written a fictional book in the style of 19th century Victorian writers of science fiction and horror or Steam Punk as it is called today. The first half of the book is the supposed letters, diary and biography of a Dr. Spencer Black who has arrived at the conclusion that deformed people, like those displayed at carnivals Interesting book, not like anything I have read before, which does not qualify it as the greatest book I've ever read. Still, there were some things to commend it. Hudspeth has written a fictional book in the style of 19th century Victorian writers of science fiction and horror or Steam Punk as it is called today. The first half of the book is the supposed letters, diary and biography of a Dr. Spencer Black who has arrived at the conclusion that deformed people, like those displayed at carnivals and sideshows are not deformed, but rather transitional mutations as a part of evolution. Furthermore, he believes that mythological creatures, such as Cerberus the three-headed dog; the Sphynx; Harpies, Mermaids and Sirens, Centaurs and Fauns, even angels, are actual creatures that evolved in certain ways, but have simply become extinct. Hudspeth cleverly leaves it to the reader as to whether Dr. Black is authentic or crazy. Black spends a lot of time in his laboratory trying to recreate these creatures by sewing together, in a weird mode a la Dr. Frankenstein the body parts of different animals, creating an amalgam of mythical beasts. 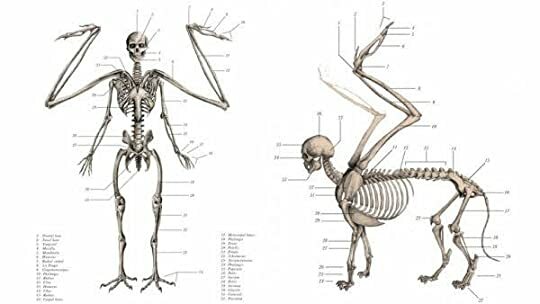 The second half of the book is illustrations of the different creatures with an minute listing of each body part, muscle, blood circulation and skeletal frame. Hudspeth offers a unique perspective by providing a small encyclopedia of mythical beasts as if they were real. Therefore, one does not get an artful painting with a history of the myth's origins, but rather a "biological" analysis in the vein of how actual animals are studied. A very spooky read. A shame that it isn't longer. It's not a ''novel'' persay, but rather the retelling of a mad scientist. First half is the story part, the second half is creepy illustrations and descriptions of the various half-human abominations the Resurrectionist believed to have existed. If you are into horror and cryptozoology, I'd definitely recommend this. If you are looking a more conventional horror novel, then this might not be up your alley. You may however be pleasantly surprised! this didn’t disappoint at all ! my only complaint is that it’s short and the author has no further books published, I’d love to read more of him. There's a lot going on in "The Resurrectionist", guys. It's not all pretty sketches of various people and mythical creatures (though those do make up a pretty big chunk of the book), but it's also all about one famous doctor's descent into utter madness. Or is it? Though this obviously draws a lot on historical bits of Americana (the vaudeville/carnie scene of the late 19th century/early 20th century) and Gothic atmospheric books like "Frakenstein", his tale is short, and it kind of 3.5/5 stars! There's a lot going on in "The Resurrectionist", guys. It's not all pretty sketches of various people and mythical creatures (though those do make up a pretty big chunk of the book), but it's also all about one famous doctor's descent into utter madness. Or is it? Though this obviously draws a lot on historical bits of Americana (the vaudeville/carnie scene of the late 19th century/early 20th century) and Gothic atmospheric books like "Frakenstein", his tale is short, and it kind of left me wanting more. If anything, it felt like a bit of a short summary of his life, and only really got detailed when he became obsessed with mythical creatures. 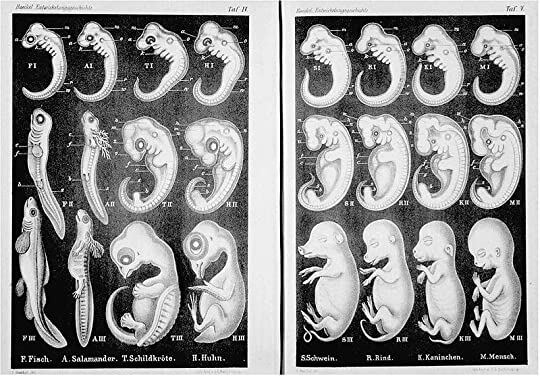 Nevertheless, if you want to see some amazing pictures of what could have been our genetic ancestors (according to Dr Black) and be treated to a tale of evolving scientific academia, definitely give "The Resurrectionist" a try. This is going to be a short review, because, well, this is a pretty short book when you take out the massive amount of sketches/bestiary appendix in the latter half of the book. My biggest complaint about this one was although we do get some gorgeous pictures and the story of a man going mad (or is he? ), it felt like one big summary of his life. I felt that there wasn't enough detail involved (especially when he starts in with the mystical creatures - only then do we get thrown a bone of sorts), and in parts, generally just felt dry in so many places within the prose. While it draws on famous stories like "Frankenstein" to give us that "mad scientist" feel to things, there were so many things missing. And that was disappointing. But what we did get was great. Not many outside of the US (and hell, even in the US, for that matter) know about the Americana history that is vaudeville/carnival culture that hit its peak in the late 19th and early 20th centuries before it started its decline. We do get a fair amount of detail on that as it is a crucial part to the story, and as there's not much out there in fiction (regardless of adult or YA in genre) that talks about that, I was really happy it was included. Traveling freak shows, genetic deformities, and so forth were apart of this vaudeville/carnival culture, and those details were included, giving us a mini history of how that whole scene came to be, and how important it became to American culture at the time, as well as American medical academia. Other than that? This is going to be a really nice coffee table book. The sketches are breathtaking, but otherwise, I wish Dr. Black's story had been a little longer and more detailed. "The Resurrectionist" is out now from Quirk Books in North America, so be sure to check it out when you get the chance! Wow, this book creeped me out as much as House of Leaves, but took less pages to do so. I love this style where the fiction is so close to reality, I have to Google to make sure this didn't really happen. The story is believable, noir, and disturbing. The illustrations are beautiful and the way the biography unfolds is mesmerizing. Or at least it was to me. I had a hard time tearing myself away. This isn't a traditional plot, but this is a great book for people into graphic novels, gothic horror Wow, this book creeped me out as much as House of Leaves, but took less pages to do so. I love this style where the fiction is so close to reality, I have to Google to make sure this didn't really happen. The story is believable, noir, and disturbing. The illustrations are beautiful and the way the biography unfolds is mesmerizing. Or at least it was to me. I had a hard time tearing myself away. This isn't a traditional plot, but this is a great book for people into graphic novels, gothic horror, and odd books. The Resurrectionist is a wild tale of fiction but could honestly have been real during the time period in which this book is set. Dr. Spencer Black grew up as the son of a grave robber, eventually making his way to the Academy of Medicine in Philadelphia, PA. He speculates about there being scientific evidence proving that mythological animals existed and their existence was covered up. After he is shunned from the Academy of Medicine, Dr. Black uproots his family and joins the carnival. He event The Resurrectionist is a wild tale of fiction but could honestly have been real during the time period in which this book is set. Dr. Spencer Black grew up as the son of a grave robber, eventually making his way to the Academy of Medicine in Philadelphia, PA. He speculates about there being scientific evidence proving that mythological animals existed and their existence was covered up. After he is shunned from the Academy of Medicine, Dr. Black uproots his family and joins the carnival. He eventually becomes so obsessed with the possibility of their being creatures that were crosses between two types of animals (horses with wings, dogs with wings, etc.) that he began inhumane experimentation. Horrified, his wife tries to shut down the entire operation only to become a victim, herself. Just a note: Those like Dr. Spencer are why there are are ethical laws concerning the humane treatment of research animals. It is inhumane to cut wings off of a chicken and sew them onto horses, dogs, or other animals. Making fictional, mythological creatures out of animals in our day in age is beyond immoral. The Resurrectionist is both intriguing and horrific. The fictional account of Dr. Black from the time he was a young boy through his disappearance provides enough information to understand what psychosis may have caused him to go off the deep end. I was truly engaged in this gruesome account of a madman who takes his obsession with deformities to an awful and disturbing level, one of crazed and perverse enjoyment. I enjoyed the second part of the book with the anatomical drawings and descriptions of several types of mythological creatures. When it comes to playing God in the proverbial cobweb-infested laboratory, the one question that science fiction writers tend to focus on is not asking how, but why. Why should we alter the path laid before us? Can His work be improved, and if so, why should we alter it? Will He be ticked off if some poor, lowly scientist decides to jolt a corpse back into the realm of the living? Will there be any consequences (i.e. smiting and/or sizeable lightning bolts hurled from the sky and such) if we decide When it comes to playing God in the proverbial cobweb-infested laboratory, the one question that science fiction writers tend to focus on is not asking how, but why. Will there be any consequences (i.e. smiting and/or sizeable lightning bolts hurled from the sky and such) if we decide to tinker with his Divine Plan? Yep. There will always be consequences galore. In sci-fi and horror literature, scientists are always overstepping the bounds of morality, civility and, of course, common sense to make the world a better place. That’s what Victor Frankenstein tried to do when he reanimated a grotesque corpse back to life. And, you can now add Dr. Spencer Black to that list of well-intentioned scientists with a knack for delving into the macabre. In E.B. Hudspeth’s The Resurrectionist, the aforementioned Dr. Black, the gifted scientist who took a wrong turn and ended up at the corner of Grave Robbery Drive and Playing God Boulevard, focuses his entire career on trying to understand why human beings suffer from physical deformities. The questions regarding nature’s ability to malfunction disturb me greatly. I never believed in the delineation of God or nature, only that certain laws maintain—one of which is function. I’ve wrestled with the fallibility of this perfect organism—our body. Eventually, the doctor develops the theory that, when a person suffers from a deformity (such as Ectrodactyly, also known as claw hand) it’s really nature’s way of tapping into the previous evolutionary steps that man experienced long ago. Case in point, the doctor—who’s repeatedly labeled as “brilliantly gifted” to drive the whole madness theme home—finds a woman with Phocomelia, or disproportionally sized limbs, and theorizes that her body is trying to jump back down the evolutionary ladder. Since she has tiny arms, an extremely arched back and over-extended neck, her ancestor must’ve flown at some point. So, ipso facto, the doctor believes she must be descended from a harpy, a half-bird, half-man creature from Greek mythology. The biography lists all the ways that the doctor tried to prove that mythological creatures once existed and that we are descended from them: He finds mummified remains throughout the world, publishes papers and books, and even opens a carnival-style freak show to showcase taxidermy mythological creatures such as minotaurs and mermaids—all made by himself, using very fresh parts. The book hints that the doctor finally takes the plunge into madness by creating living mythological creatures—terrible patchwork monsters made from jumbled and mismatched parts, assembled solely because one fallible man believes that all “imaginary” creatures, from centaurs to satyrs, were once quite real. This is Hudspeth’s first book, and it’s a great first effort. The biography-style writing makes for an entertaining read, and the mad scientist tale is spelled out simply and succinctly, which is never an easy thing to do. However, if there’s one big flaw with the book, it’s that it raises more questions that it answers. You never understand how Dr. Black creates his creatures, or which creatures he successfully gave life to or which ones were only taxidermy toys. Also, little information is given about The Sleepless Man (no spoilers here) which is a big letdown, and the storyline gaps (why did the brother rarely intervene?) and the lack of setting detail left me feeling detached at the end. Though the premise is very interesting and promising, the illustrations throughout the biography seemed to outshine the story—which leads us to the second portion of the book. The second part of the novel is a Gray’s Anatomy-style codex of all the creatures Dr. Black believe once existed. The level of detail with these illustrations is enthralling—describing the maddening amount of medical minutiae that the author (who did all the illustrations) included in every illustration is frustrating and doesn’t do the work any justice. I uncovered The Resurrectionist: The Lost Work of Dr. Spencer Black whilst "window shopping" at a local gaming & book store the other day. I use the scare quotes only because this book took the day's activity and transformed it from just-looking to I'll-have-this-thank-you-very-much territory. After but a few moments of flipping through it, I knew it needed to be added to my already pretty extensive collection of art anatomy books. Where this one differs from the rest of my collection is thi I uncovered The Resurrectionist: The Lost Work of Dr. Spencer Black whilst "window shopping" at a local gaming & book store the other day. I use the scare quotes only because this book took the day's activity and transformed it from just-looking to I'll-have-this-thank-you-very-much territory. After but a few moments of flipping through it, I knew it needed to be added to my already pretty extensive collection of art anatomy books. Where this one differs from the rest of my collection is this: it's a complete fabrication, but one done with obvious fascination for biomechanics. This was confirmed by watching an interview at the author/artist's website, in which he details how the book came to be. I recommend the interview, but probably only after you've read the book. Not because the interview is spoilery, per se, simply that it's more fun to discover the book on its own terms first-hand, then learn the backstory. I also recommend that you not read further in this review until that time comes. That's right, go get a copy, then come back after you've read it and we'll talk some more. Yes, I'm recommending it. Go on, get. I'll put a bit of this review behind a spoiler tag... (view spoiler)[So, I'm not saying this is a five star book, but this book is nevertheless a worthwhile expenditure of time, lovely and haunting in its execution. A trained eye, in flipping through the anatomical drawings, will note some pretty big liberties were taken. I won't venture too far into the weeds here, but for instance: a human doesn't have eight cervical vertebrae, nor can the 7th (or even the mythical 8th) cervical vertebra—or, heck, even the first few human thoracic vertebrae—neatly transition into the thoracic vertebrae of a lion, for instance. And before you ask, yes, I have actual anatomy reference books that detail the skeletal structures of both humans and lions in my library, conveniently enough. And while I have zero personal experience with lions, I spent hundreds if not thousands of hours studying human osteology when I was a student at UTK's Forensic Anthropology Center. However, if you view these same images again after having read the front half of the book, you come to realize what those drawings are meant to be, and, at least in my case, I was willing to suspend my initial annoyance/disbelief, and instead appreciate the work on its own terms. The first ‘book’ in this is an interesting read. The writing style is reminiscent of the the great gothic horrors of old such as Dracula, Frankenstein, and Jekyll and Hyde. I really enjoyed following Dr Black’s life. His descent into madness, paranoia, and delusions was done really well. The pacing is a little slow in areas. The second ‘book’ is a print of the fictional Dr Black’s The Codex Extinct Animalia: A Study of the Lesser Known Species of the Animal Kingdom. I thoroughly enjoyed looking The first ‘book’ in this is an interesting read. The writing style is reminiscent of the the great gothic horrors of old such as Dracula, Frankenstein, and Jekyll and Hyde. I really enjoyed following Dr Black’s life. His descent into madness, paranoia, and delusions was done really well. The pacing is a little slow in areas. The second ‘book’ is a print of the fictional Dr Black’s The Codex Extinct Animalia: A Study of the Lesser Known Species of the Animal Kingdom. 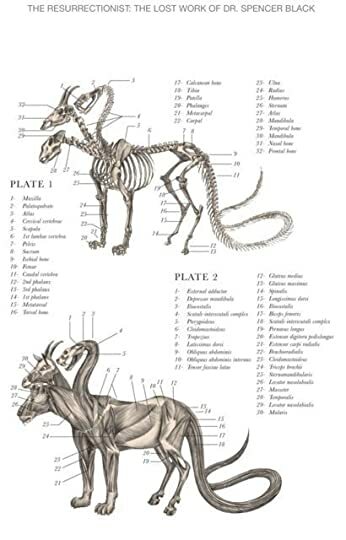 I thoroughly enjoyed looking through these anatomical illustrations and studying each creature. Have you ever read a fictional biography where for some of the initial chapters you really thought it was a real character? Well, that is what happened to me with this book. About 1/3rd of the way through the first part of the book I stopped reading and searched for "Dr. Spencer Black" on google and wikipedia to get real info on him and found out he was a fictional character. This was a rather new experience for me. As I am a doctor myself (recently passed) and have the desire to become a surgeon Have you ever read a fictional biography where for some of the initial chapters you really thought it was a real character? Well, that is what happened to me with this book. About 1/3rd of the way through the first part of the book I stopped reading and searched for "Dr. Spencer Black" on google and wikipedia to get real info on him and found out he was a fictional character. This was a rather new experience for me. As I am a doctor myself (recently passed) and have the desire to become a surgeon from the first time I read about the book I was interested in it quite a lot. I mean I am also a huge fan of fantasy genre and who from my background with such interest in books would not love to see a detailed anatomy of mythical beast? The book has 2 distinct parts. First part is the fictional biography of Dr. Spencer Black, a charismatic surgeon of congenital anomalies. This biography was written with quite a lot of effort to authenticity as far as I can tell as the first few chapters were so believable as truth. Although at first it was a bit boring for this "trying to keep it real attitude", the later parts were quite fast-paced and interesting indeed. This part tells the story of traumatic childhood to becoming an young and successful surgeon to ultimately fall into a dark path of false belief which finally lead the doctor into joining a circus. The story although a bit boring at times really show the effort the author had put into making it sound real. I really get the fact that there are some shock values for readers in some deeds of the doctor but frankly wasn't that surprised or shocked myself. The 2nd part is the best in many regards. As mush as the pictures and little explanatory notes before them was enjoyable the artist also tried to keep things real. Although I can't really get the idea around my head (or agree whatsoever) how the doctor explains he came to believe that mythological creatures are our ancestors I really liked the detailed drawings, and how the doctor tries to co-relate the bones and muscles with those present in human, he also uses quite innovative names for the new fictional bones and muscles. This as a recently passed medical student was really quite fascinating for me. And quite frankly it was not so much like "Gray's Anatomy" but like an "Atlas of Anatomy" of mythological beasts (which is much more interesting in my book). I would really recommend this to anyone interested in mythological beasts or any fantasy fans coming from a medical background like myself. First let me say what a fun book. I got this book through a reviewers mailing list I am on. A great debut book from author E.B Hudspeth. Written in two parts. Part Frankenstein, part Grey's Anatomy. This makes for a good adventure. It starts out with a biography of Dr. Spencer Black, a doctor, a scientist, a mad man. Obsessed with animals and anatomy he transforms life to make new creatures of all sorts. I thought the biography section was a little short, but it did it's job well. Maybe in later First let me say what a fun book. I got this book through a reviewers mailing list I am on. A great debut book from author E.B Hudspeth. Written in two parts. Part Frankenstein, part Grey's Anatomy. This makes for a good adventure. It starts out with a biography of Dr. Spencer Black, a doctor, a scientist, a mad man. Obsessed with animals and anatomy he transforms life to make new creatures of all sorts. I thought the biography section was a little short, but it did it's job well. Maybe in later books we'll see Dr. Black again. The Second half of the book is really amazing. filled with pictures and diagrams all drawn and written by Spencer Black. I absolutely loved the detail in the end. Featuring a lot of mythical creatures many may recognize. It shows every angle inside and out of each creature. The quality of this book amazed me. To me it felt and looked like an actual reference book or perhaps a college book on anatomy. I know that it is fiction, but it has that appearance. The illustrations in the book are incredibly detailed. Those alone make the book worth getting. As for the story itself, I really found myself comparing Dr. Black with Dr. Frankenstein from the Mary Shelly classic. Although Dr. Black was not 'creating life' he was meddling in areas where perhaps man was not supposed to meddle. I do wish we learned more about Dr. Black and his insane life but I suppose the lack of information actually adds to the macabre feel of the story. I would highly recommend this book to everyone, especially those with an interest in legendary creatures and mad scientists. A Nineteenth Century setting with dark macabre scientific experiments — how could I not love it? While the book is dark and creepy with a strong Frankenstein-esque vibe, I don’t think that it is too over the top. Much of the story of Dr. Spencer Black, plays out in our imagination. Easily the high point of the book has to be the eye-popping illustrations. It’s a book that I plan to keep on my coffee table rather than hide in a bookcase. Sphinxes, sirens, satyrs, and mermaids are all beautifully dissected and artfully displayed for our grisly perusal. It begs the question, if this is the art of a madman, what does it say about a person like myself who enjoyed it so? Hmmm. The Resurrectionist is about the unorthodox practices of controversial scientist Dr. Spencer Black. The book starts with a short biography about his life then with Black's magnum opus, The Codex Extinct Animalia, a Gray’s Anatomy about mythological creatures that existed. The biography was dull and monotone considering the subject matter. Author lacks voice since the voice in Black's book sounds exactly the same as his biographer. The Resurrectionist has a great concept but completely fails in i The Resurrectionist is about the unorthodox practices of controversial scientist Dr. Spencer Black. The book starts with a short biography about his life then with Black's magnum opus, The Codex Extinct Animalia, a Gray’s Anatomy about mythological creatures that existed. The biography was dull and monotone considering the subject matter. Author lacks voice since the voice in Black's book sounds exactly the same as his biographer. The Resurrectionist has a great concept but completely fails in its execution. Two stars for writing and four + for the beautiful medical drawings. 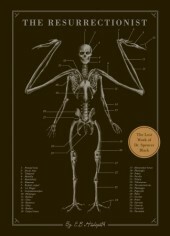 The Resurrectionist is a book that had a lot of potential as a book about a scientist who goes mad trying to prove a theory without any supporting evidence, a theme I think has become incredibly relevant, that also explored the medical practices of the 1800's and the view people had of people born with physical defects. I say potential for while it does dip into these things, the author seems more occupied trying to convince the reader that this fictional doctor was a real person. This makes the The Resurrectionist is a book that had a lot of potential as a book about a scientist who goes mad trying to prove a theory without any supporting evidence, a theme I think has become incredibly relevant, that also explored the medical practices of the 1800's and the view people had of people born with physical defects. I say potential for while it does dip into these things, the author seems more occupied trying to convince the reader that this fictional doctor was a real person. This makes the book feel more like a summary of a way more interesting story and makes the real thing it's based on feel like something the author made up, despite the fact that a lot of things that are stated are based in reality. It would honestly have served a much better purpose as a purely fictional book that made the reader ask if what was written had a basis in reality or not. The writing style is the bare minimum and while I like the seeds of madness put in the early journal entries, the book is also filled with things that stretched the suspension of disbelief to the point that if it was real suspenders you'd wear your pants on your knees if you used them as the only means to keep your pants up. I've always been drawn to books that describe moral human depravity and treat the downhill spiral of a man becoming a monster. This book failed to do so. Despite its misleading description, the actual biography was short,fairly disappointing and uneventful. The drawings were fascinating, but then again, I was expecting a more detailed literary work,rather than a mythical creature atlas. Probably one of the more bizarre additions to my bookshelf, but a terribly welcome one, this feels and reads like a forbidden, redacted science teacher's journal who may have gotten in too deep with taxidermy and biology. While the story itself (if one could even call it that) is criminally short and open-ended, the diagrams and sheer detail behind some of these terrifying animals more than makes up for that. It's on that merit alone I gave it four stars. Some may argue this is nothing more than Probably one of the more bizarre additions to my bookshelf, but a terribly welcome one, this feels and reads like a forbidden, redacted science teacher's journal who may have gotten in too deep with taxidermy and biology. While the story itself (if one could even call it that) is criminally short and open-ended, the diagrams and sheer detail behind some of these terrifying animals more than makes up for that. It's on that merit alone I gave it four stars. Some may argue this is nothing more than a glorified fantasy tome with one eye on H.P Lovecraft's bibliography and the other scrubbing the pages of a forgotten Darwin diary. However, the creatures themselves have more substance than some characters I've seen in blander novels. Ever since I started drawing and painting animals from life, I've wondered about the anatomy of mythical breasts. How can Pegasus support his wings, how can a mermaid function. The mad scientist story is creepy and enthralling, but e pages and pages of perfect anatomical drawings that made me spend whole evenings with this book. I felt this story was a little generic? Like if you've read Dr. Jekyll and Frankenstein you've already read this one. I found the narrative structure of framing the story as a biography of a fictional scientist really interesting, but I don't think it was sufficient to play up the horror elements of the story. This book also suffer from the same failing of 90% of 19th century literature, which is the lack of women and female agency. The only woman character in this book is a long-suffering and l I felt this story was a little generic? Like if you've read Dr. Jekyll and Frankenstein you've already read this one. I found the narrative structure of framing the story as a biography of a fictional scientist really interesting, but I don't think it was sufficient to play up the horror elements of the story. This book also suffer from the same failing of 90% of 19th century literature, which is the lack of women and female agency. The only woman character in this book is a long-suffering and loving wife who becomes another experiment? The anatomical drawings were (mostly) beautiful, except the faces always seemed off? Also as a graphic designer I cringed at a lot of the "Victorian" design elements. Hmmmmmm.... Such an interesting story! But I felt this telling left me with a large feeling of lacking and wanting more. The telling of Dr Black's life ends abruptly with out much of a resolution.... like, really abruptly. I did find it intriguing that such a brilliant mind had such a different take on physiology and evolution. I could almost see it from his point of view! But, his testing on live subjects was quite morbid, in an ethical sense. Cause I like morbid. I just wanted more of the stor Hmmmmmm.... Such an interesting story! But I felt this telling left me with a large feeling of lacking and wanting more. The telling of Dr Black's life ends abruptly with out much of a resolution.... like, really abruptly. I did find it intriguing that such a brilliant mind had such a different take on physiology and evolution. I could almost see it from his point of view! But, his testing on live subjects was quite morbid, in an ethical sense. Cause I like morbid. I just wanted more of the story, even if there isn't anything in history to give me more, I felt it could have been written to make it not seem so lacking at the end. This review has been hidden because it contains spoilers. To view it, click here. ... the famous anatomist and surgeon Dr. Spencer Black. Wow! The Island of Doctor Moreau, Dr. Frankenstein, and a remember the pictures in Mr. Peregrine's Home for Peculiar Children? Those illustrations are not only great, they almost make me believe in mythical creatures. The premise that the creatures are our evolutionary ancestors is just too good. I was so disappointed that the story was not longer. Hoping for a sequel. "Unlike the traditionally accepted theories of evolution and natural selec ... the famous anatomist and surgeon Dr. Spencer Black. "Unlike the traditionally accepted theories of evolution and natural selection, Black’s view stressed that mutations are not accidents; instead, they are the body attempting to grow what it once had thousands of years ago." The descent into apparent madness. "The entire body is the soul, and my knife cuts deep into the flesh; I vow to be always reverent with the edge of my scalpel." "Doctors are not gods; but we do their work. —Dr. Spencer Black"
Much like Dr. Jed Hill in the 1993 movie "Malice". "He theorized that the same reasoning used to heal or reverse a deformity could also serve to engineer a deformity; he would have to create what he thought the body (nature) had originally intended." Doctor Moreau without the island. Dr. Frankenstein. "He asserted that he could change the genders and ages of his patients. He performed his surgeries live on stage, in what surely must have been macabre performances." Actually, this is done now but not with a stage and paying audience. Las ilustraciones son geniales, por el nivel de detalle y el realismo aplicado a la anatomía de criaturas fantásticas. Este es un punto que destaca completamente. La historia, por otro lado, te plantea un protagonista que tiene muchísimo potencial para ser interesante, pero es tratado de manera muy superficial, en el estilo de una breve biografía complementada con notas escritas por el mismo. Lo disfruté, sí, pero el personaje daba para mucho más. (PD: No es una buena idea comprarlo en versión kin Las ilustraciones son geniales, por el nivel de detalle y el realismo aplicado a la anatomía de criaturas fantásticas. Este es un punto que destaca completamente.